Jim Amidon — When the League of Women Voters reached out to Wabash President Pat White about the College’s willingness to host a Candidate Forum, he quickly agreed to open up the Fine Arts Center. The Forum, held last Wednesday, featured the candidates for the State Superintendent Public Instruction, the incumbent, Dr. Tony Bennett, and his challenger, Glenda Ritz. For President White, it was an easy decision to say yes because of the neat connection to Wabash: Our first professor, Caleb Mills, founded the public school system in Indiana and served as the state’s second superintendent back in 1847. Organizers and participants in last week’s Forum pose for a photo before the event. By any measure, the event was a huge success. The Montgomery County LWV, headed by Kathy Brown and staffed with a huge volunteer base, helped the state LWV get the word out and execute the Forum, which was attended by over 300 people and watched live in more than 400 locations. Behind the scenes, literally dozens of people worked together, efficiently I might add, to make it look to visitors like the event was months in planning. In reality, we had two weeks to pull it off. 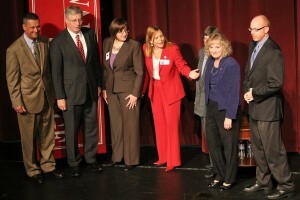 So how does a political forum that attracts media attention and attendees from across the state come off so smoothly? It takes a campus — and then some — to host an event with so many moving parts (not to mention competing politics). Once the Fine Arts Center’s Ball Theater was secured, we reached out to Eileen Bowen, who so beautifully manages the box office for all of the events in that building. But to suggest she simply runs the box office would be a huge understatement. We leaned on Eileen for two solid weeks and by the time the Forum began at 5:30 Wednesday, she’d exchanged well over 50 emails with various organizers and planners. Working with the Indiana LWV leadership, Eileen carved up Ball Theater perfectly — seating Dr. Bennett’s staff on one side of the theater and Ms. Ritz’s staff on the other. By 4 p.m. Wednesday, LWV volunteers were staffing tables with the names of ticket holders all perfectly organized. The collaboration between Eileen and the LWV was a thing to behold. The theater’s scene designer, James Gross, got the stage ready with proper lighting and banners. We also knew that our theater, which seats exactly 358 people, would not accommodate the demand for tickets. That meant we had to broadcast it and stream the feed live through the Wabash website. For that, we leaned on Adam Bowen and his talented student workers in the Media Center. Adam and his students create all of the glorious event posters you see around the Wabash campus, but they also produce all of Wabash’s football games for live broadcast, as well as other important campus events. They manage hundreds of videos on the College’s YouTube channel. But moving the Media Center equipment to backstage of Ball Theater was no easy task. The guys worked six hours to set up the equipment for the one-hour broadcast. It took another three hours to tear it all down. If you tuned in, you would have been blown away by the quality of the broadcast and the professionalism with which it was accomplished. Brent Harris, who manages our sports information and marketing office, was also called in for extra duty. Brent is a tech-whiz, so when we do live events like this, we often ask him to bring a truckload of sound equipment and make sure it works. He was also savvy enough to know that television news media would need sound feeds, so he made that a breeze, too. We enlisted student workers to help in the lobby and in the overflowing Fine Arts Center parking lot. We asked Rich Woods, Wabash’s incredible director of safety and security, to help us make sure it was a safe environment for the candidates and the crowd. Rich enlisted some off-duty CPD officers, who helped us before, during, and after the Forum. When Kathy Brown took to the lectern at 5:30 and the broadcast went live, the audience and Internet viewers likely had no clue that over 50 people worked very quietly behind the scenes to make it look so seamless and professional. I’m guessing that virtually everyone in attendance took for granted the intricate details of coordination and collaboration. But having planned and executed events like this at Wabash for a few decades, I know how much work — and how many people — it takes to make them happen. We’re blessed, both at Wabash and in Montgomery County, to have so many selfless, dedicated people willing to work together for the betterment of our community. Howard W. Hewitt – Success events require detailed planning and thinking a bit out of the box for real success. 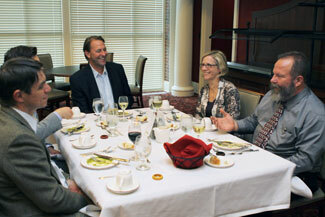 Food author and Celebrity Chef Michael Ruhlman’s visit was enhanced by the participation of Bon Appetit. Ruhlman could have come and done his two talks, visited Marc Hudson’s writing class, and done a couple of interviews and everyone would probably have been satisfied. But when Bon Appetit was approached to be a part of this unique Visiting Lecture guest, General Manager Mary Jo Johnston and Chef Jordan Hall jumped at the opportunity. Now as an aside, not every event lends itself to enhancement but many could. The most visible participation was Sparks’ noon, Oct. 16, lunch. Chef Hall selected five recipes for lunch. 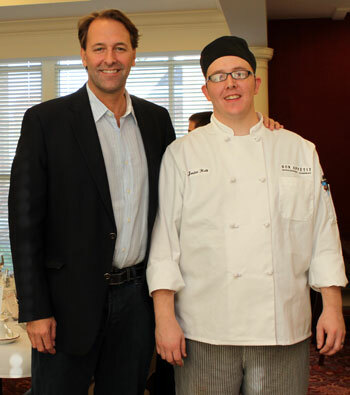 Ruhlman visited the food line Thursday before Sparks opened for lunch and was genuinely thrilled that his recipes were used by the College caterer. He even tasted a couple of the dishes. Bon Appetit, or more specifically Executive Chef Jordan Hall, got the chance to really show off at a private evening dinner. 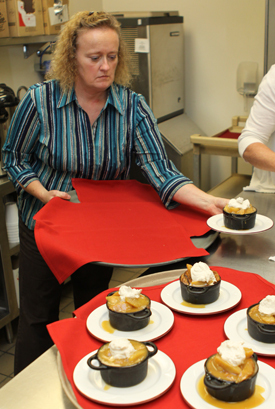 Hall supervised the Trippet kitchen and prepared a high-end restaurant worthy menu that had the 18 attendees raving. It was “wows” all around! It’s always good to give your best a chance to show off. Mary Jo Johnston had to be a very proud manager Tuesday night! Jim Amidon — Not long ago in an alumni survey, about 12 percent of Wabash College alumni told us they held the title of owner, president, or CEO. That’s a pretty remarkable figure, especially for a liberal arts college like Wabash that offers no business major or minor. The undergraduate courses students take a liberal arts colleges provide the broad base from which success evolves. Wabash’s alumni say that courses in English, classics, rhetoric, and the sciences, when combined with work in economics, help them communicate effectively, learn from mistakes, solve problems, and see the big picture. Our economy today, however, suggests that students should go to college to learn something practical so that four years hence, they emerge with skills that will lead to a job. A.G. Lafley, who was president, chairman, and CEO of Procter and Gamble, thinks differently. Writing in the Huffington Post, Lafley heralded the work of our nation’s liberal arts colleges. “As someone who spent many years assessing the skills and talents of management prospects for a wide range of disciplines and industries, I know that the candidates who were the most attractive manager prospects were those with a well-exercised mind, leadership potential, and the passion to make a difference,” Lafley wrote. “These success factors can be cultivated in many ways, but all are best developed by taking courses in the liberal arts and sciences. When Wabash College recruits potential students, nearly half tell us they’re interested in a career in business. At 17 or 18 years old, most don’t have a clue what that means — management, accounting, manufacturing, taxes, HR, or finance — but they have a hunch that they can make money in business. But for those who have the longer view — who wish to move up the corporate ladder or develop the entrepreneurial skills to create a start-up — an undergraduate curriculum limited to business will be too narrow. Wabash’s track record speaks for itself. 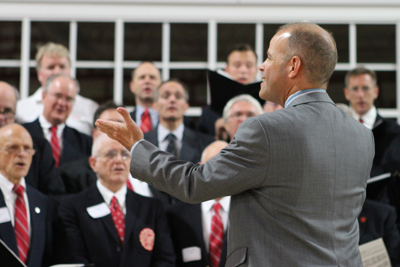 But over the last decade or so, the College has invested enormous resources into co-curricular and extra-curricular programs to help Wabash graduates compete right out of the gate with students who have attended business programs. Through the Schroeder Center for Career Development, the staff, headed by Scott Crawford, starts working with students from the moment they arrive on campus. Whether they want a career in business, the arts, or the sciences, students are best served when they show up at the Schroeder Center as freshmen. They’ll learn how to discern their true vocation. They’ll get help with writing effective cover letters and resumes. They can attend “boot camps” to prepare them for graduate school exams or interviews. So that they look their best at an interview, students can check out suits from a large collection stored at the Schroeder Center. There are also dozens of job fairs, networking events, externships, and internships that round out a student’s experience in class. Betsy Knott heads up the Business Leaders Program, which involves a set of courses from across the curriculum and immersion experiences that further develop students. Some participate in a paid, eight-week summer business immersion in which they spend half their time in class and half learning from business leaders and developing business plans. There are also short-term immersions into marketing and, beginning this week, finance. These four- or five-day programs allow students to focus on key components of business through both classroom learning and hands-on experiences. An immersion experience in healthcare management will be offered in the spring semester. All of these co- and extra-curricular opportunities are there for the taking. The wise student who thinks seriously about his long-term future, gets started early in his time at Wabash. That allows him access to the full range of programs — from on-campus research with faculty to internships with some of the great companies in America. Students who can incorporate those pieces into the liberal arts puzzle — along with sports, arts, student government, and journalism — become exactly the kind of graduate who can succeed in any business environment. And at Wabash, that’s a winning formula, indeed. We’re always excited and please to honor student work. Senior Devan Young has untertaken a video series called “Senior Seminar.” He is interviewing Wabash seniors not just about their collegiate experience but about their lives. Here is the second installment with Jose Herrera. And here is a Bachelor story from last week’s issue about Young written by sophomore Ben Bradshaw. The Bachelor – Wabash doesn’t have a Telecommunications Department, but that has not stopped Devan Young ’13 from sharing his interest. Young is a Theater major from Chino Hills, Calif., a city just outside of Los Angeles. After coming to Wabash for Honor Scholarship Weekend during the spring of his senior year of high school, Young fell in love with the campus. “The idea of leaving the West Coast was tough, but it was well worth it,” he said. Young is a brother of Kappa Sigma Fraternity. He is also involved in the MXI and APO. He’s been involved in several plays in the past few years, the last of which was The Miser last spring. Young enjoys the brotherhood, as well as the academic challenges Wabash presents. This summer, the senior was given the opportunity to intern with Fox Sports Network in Los Angeles, Calif. While interning with the entertainment company, Young worked in the Engineering and Operations Division. “I was given the opportunity to observe what company employees did everyday and performed some computer work,” Young said. His internship related directly with his plans for the future. “I loved my time at Fox because I was able to work close to home and the experience was unforgettable and invaluable,” he said. 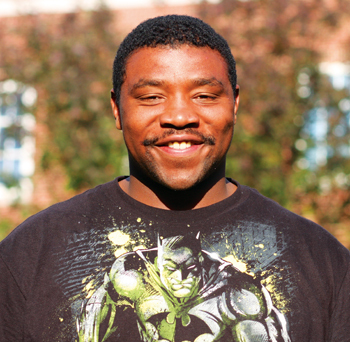 Currently, he is researching graduate programs in journalism and film to enroll in after he graduates. The episodes will be a ten-part series, with an episode airing every week. Currently, the videos may be viewed on the Wabash YouTube channel, but soon they may have their own link on the Wabash website. Make sure to watch the episodes to learn more about the stories and talent held by members of the class of 2013 and host Devan Young.